Aquasana water filters have been named a "Best Buy" by Consumers Digest and "one of the seven healthiest new products for your home" by Health magazine (June 2010). 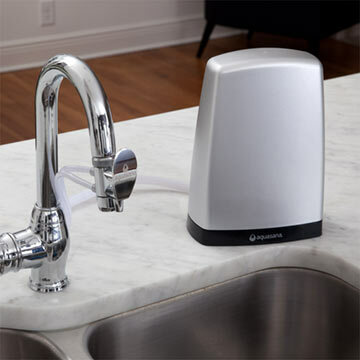 What I like best about the Aquasana AQ-4000 countertop water filter is that it is certified to filter out over 40 water contaminants, but it leaves in healthy minerals for superior hydration and pH balance in the body. These filters remove over 99 percent of the chlorine, lead, herbicides, pesticides, industrial solvents and cysts found in tap water, just to name a few of the most prevalent contaminants. Aquasana's contaminant reduction capabilities are third-party tested and certified by Underwriters laboratories and the California Department of Public Health. This water filter system produces great tasting, healthy water and is a great value for the price ($125 retail). See below for available discount. Manufacturer: Sun Water Systems, Inc. is the sole manufacturer of its products. In 1999, Aquasana products were designed for making healthy drinking and bathing water easily accessible. See numerous awards and certifications on their site. Installation: Installation is easy and sets up in minutes. Filter replacement: Patented twin water filter cartridge set filters 500 gallons (about 6 months) and cost about $60 to replace. For more product specifications or to buy now and get a 20 to 30% off discount, go to Aquasana AQ-4000 countertop water filter.